When it comes to culture, Berlin is always worth a trip. 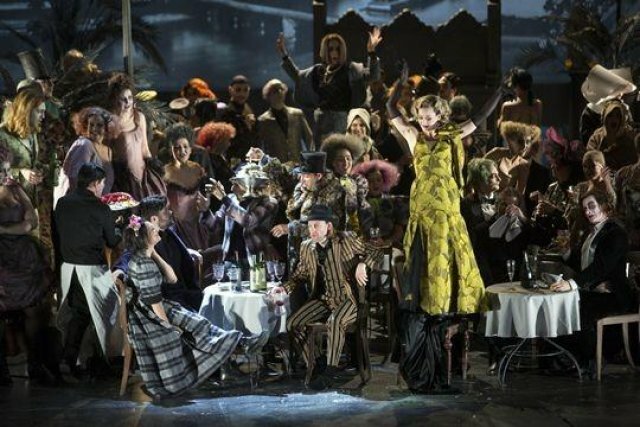 And a great trip it was, to experience the opening night of Barrie Kosky's interpretation of La Bohème, by Giacomo Puccini, on Sunday, January 27, 2019 at the Komische Oper (Comic Opera) in Berlin. One of three opera houses in Berlin, the Komische Oper, has been noted for extraordinary productions since the times of its famed director Walter Felsenstein. Its present director Barrie Kosky continues this tradition by offering fabulous operas with innovative twists and turns. His La Bohème is no exception. It is the fifth production of Puccini's opera there, the first time sung in Italian. (No problem here since the translations in English, German and French can be chosen at the seat in front.) How much Berlin cherishes the Komische Oper is underscored by the fact that the opening attracted Berlin's artistic and political elite. Officials of the other two opera houses were spotted, as well as Berlin's Mayor Michael Mueller and the cultural senator Klaus Lederer. It is a subdued Kosky production, restrained, almost minimal in all but the second act. Jordan de Souza's conducting aptly supports the action on stage, completing music and acting into a harmonious entity, while always hinting at the dismal situation of the impoverished bohémians in 19th Century Paris. Rufus Didwiszus' stage-settings add an overall impression of pending doom. He has chosen as backgrounds for all four acts images from daguerreotype reproductions, where gray in gray dominates. 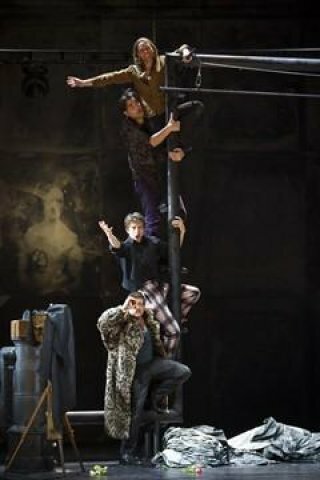 At home in the seediness of this Paris the three artist friends, the photographer Marcello, presented by a great Guenter Papendell, the writer Rodolfo, sung by powerful tenor, Jonathan Tetelman, and Philipp Meierhoefer as the philosopher friend Colline. A bit of happiness ensues when Mimi, sung with a lovely clear soprano by company member Nadja Mchantaf, meets Rodolfo. The drabness is temporarily lifted further in the second act at the Café Momus, when Rodolfo introduces Mimi as his love. Marcello's girlfriend, the charming and resourceful Musetta (Vera-Lotte Boecker) is there to drive the men crazy, as she takes center stage within this teaming action. It is, at long last, a trademark Kosky scene again, an indulgence in form, action and colorful costumes. The children and the adult choir show off at a rotating stage within the regular stage, causing even more motion and commotion. Here, a sense of happiness and frolicking abounds. As the world knows, however, this is not to last. The third and fourth acts return to the misery of life in poverty. Mimi finally dies of tuberculosis, the friends are heartbroken, and must continue to muddle through their shattered lives. The final scene is heart wrenching: Mimi sits dead on a chair, alone, with the lights slowly dimming and the music ceases to be audible. It holds the most powerful image of the entire opera and creates an impactful finale. 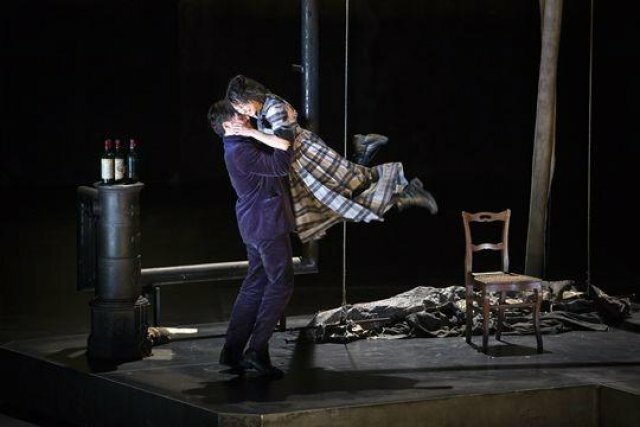 La Bohème was created by Puccini in 1896 after Henri Murgers novel La Vie de bohème and is one of the operas that has seen interpretations by famous directors and conductors all over the world. Barrie Kosky's production focuses on the fusion of acting and singing. He is not afraid to highlight the unromantic aspects of life as an artist, and thus achieves to bring the 19th Century successfully into our modern times. If a visit to Berlin is out of the picture, the opera can be seen live under www.operavision.eu for the next six months. It may well be worth viewing, especially by opera lovers, since Kosky will leave the Komische Oper in 2022 as its director. Then, the opera house will close for renovations as well. Kosky will eventually return as guest director to the Komische Oper Berlin as well as direct at other opera houses internationally. That will prove to be great for his career, yet also a definite loss for Berlin’s Komische Oper.